Forty years after a string of killings in Haddonfield, Illinois, Michael Myers escapes from a prison transport bus to unleash hell and wreak havoc on the town of his youth and the one person who escaped his rampage: Laurie Strode. The first boon to David Gordon Green’s direct sequel to John Carpenter’s original Halloween is the decision to pretend that the bounty of sequels – and a pair of Rob Zombie films – never happened. Michael Myers never got loose (repeatedly), surviving sure death and mutilation (also repeatedly), and the continued adventures of Dr. Loomis never became the focal point of a series that began as one of the earliest examples of female-empowered slasher flicks. This choice is freeing – and opens it up for a couple referential jokes to cut the tension – allowing it to be more its own thing instead of the eighth installment of a long-running and stale series. Then there’s Jamie Lee Curtis returning to the role she made famous in the original. Laurie Strode is shown through the lens of time and trauma, and how one night of terror and pain has derailed her life over four decades. She is a hermit waiting for the day Michael Myers finally gets free with her heavily-armed bunker of traps and guns. Curtis is fantastic, which should come as a shock to nobody, playing Strode with a combination of badass resolve, constant fear, and exhaustion. She is strong without being superhuman. Her slightly estranged daughter Karen (Judy Greer) was taken away by children services at 12 because authorities believed that training her to be a killing machine in the middle of the woods was inappropriate for her development. Now, with a daughter of her own in Allyson (Andi Matichak) on the cusp of adulthood, we have three generations of Strodes who will inevitably come face-to-face with the masked killing machine of Michael Myers. It’s with mild disappointment that Halloween is overstuffed with extraneous subplots and tertiary sequences. Instead of opening with Laurie Strode or even the escape, there’s a prolonged story following a pair of true crime podcasters trying to get to the bottom of the Haddonfield killings before Michael Myers is transferred. Their arc serves one purpose only – to jumpstart a body count (this should not be much of a spoiler). It’s a baffling choice to spend so much time with these characters who offer nothing really of interest other than a bit of commentary about society’s collective obsession with serial killers and their stories in audio format. Dr. Sartain (Haluk Bilginer) likewise adds padding to overcomplicate things with his obsessive, lifelong study of Myers in the hospital. While he gets an appropriate send-off that is one of the best moments of the film, everything before is delivered lazily. It exists to undercut the idea that there is anything to learn about Myers’ psyche or motivations. There is nothing to learn about human desire from Michael Myers’ brain, and that’s what makes him so terrifying. Putting the fine point on this in the form of Sartain turns what should be subtext into actual text adding to the bloat that weighs down what could be an excellent slasher movie. Fortunately, it’s no tall task to become the second-best entry in the Halloween series. And what Green’s film – co-scripted with Danny McBride and Jeff Fradley – does well elevates it from being anything close to a disaster. This is a fun movie, especially if seen with a group of horror fans. While there are jump scares aplenty, they don’t feel cheap because the build-up of tension is so often given an appropriate amount of time. One of the best scenes in the film follows Allyson’s best friend Vicky babysitting a crass pre-teen, planning for her friends to come over once the kid’s in bed. It starts with a noise, a fake-out, and then it hits the fan. Every beat, though ultimately familiar, is effective. And while the side characters are treated largely like sacrificial lambs, Allyson’s friends get a little more to do and feel more of a piece with the movie than the podcasters. If anything, more time should have been dedicated to Allyson’s life in high school and her relationships to make the impending violence feel even more palpable. The same can be said for Karen, the middle Strode. Judy Greer is a great performer, both in live-action roles and animation, but Karen Strode doesn’t do her any favors and neither does the script. For most of the film, she is terribly one-note and used primarily as an exposition device to say how messed up her childhood was. She does what she can, and other than a couple fist-pumping moments near the climax, the role is a limp blank slate. Laurie and Allyson are the ones who get a chance to show their depths with more flare, and while it could be stated that Karen has spent her whole life bottling up who she is in order to escape her mother, it doesn’t feel so much subtle as it does empty. The glue that holds Halloween together in the end is an outstanding, updated score from John Carpenter himself alongside son Cody Carpenter, and Daniel A. Davies. The iconic theme from the original is intact, but there are variations on it with electronic surges and more aggressive punctuating tones. It adds an extra layer that serves the film’s terror without taking center stage. It’s always recognizable, but never distracting. It’s excellent. (As an aside, if you ever see John Carpenter is touring near your city with his music, do yourself a favor and buy a ticket. It’s a wonderful and unique experience). It’s also photographed very well by cinematographer Michael Simmonds. For all the guff I give the podcaster subplot, the image of Michael Myers standing inside a taped-off square (that you don’t dare cross) with his back to the audience is successful in generating that initial unease that sets the stage. 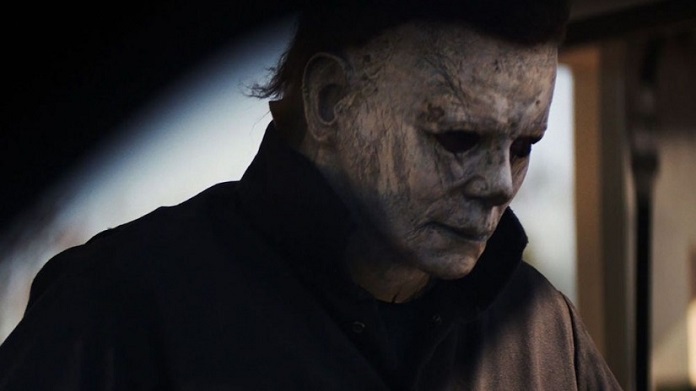 Halloween is simultaneously better than it probably should have been and a missed opportunity undone by bloat and one catastrophically uninteresting subplot. The humor (expected with McBride as a co-writer) never oversteps, and actually acts as a nice buffer and palate cleanser in between gruesome bouts of gore. It makes the characters feel more real, and the terror heftier because the violence snuffs out the joy of these people quite literally. So while it won’t quite enter the slasher canon’s top tier, there is enough to satisfy that particular itch.